Sylvia W. Emmons, age 90, died early Saturday, January 26, 2019 at her longtime home in Greenville. Sylvia lived a long and happy life secure in the love of the Lord. She was born April 20, 1928 in Milltown, New Jersey, the daughter of Edgar and Barbara (Kuhlthan) Waters. She married Harry J. Emmons on October 18, 1947. 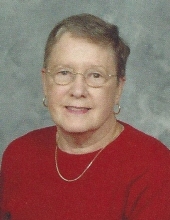 Sylvia was a longtime active member of Mt. Calvary Lutheran Church, and was also a member of the Flat River Historical Society and founding member of Lifelong Learners of Montcalm Community College. She served on the Greenville Area Housing Commission and was a volunteer for Habitat for Humanity and the Greenville Area Ecumenical Food Mission. Sylvia was preceded in death by her husband, Harry; daughter, Barbara Suydam; and two sisters, Lorraine Gross and Wanda Freehan. She is survived by her sons, Peter Emmons of Greenville and Paul (Cecilia) Emmons of California; grandchildren, Gretta (Nick) Fox, Mark Emmons, and Ruth Emmons, all of California; and other relatives and friends both in New Jersey and Michigan. Memorial services will be held at 11:00 am Saturday, April 6, 2019 at Mt. Calvary Lutheran Church, Rev. Jeffrey Wilhelm officiating. Memorial contributions may be given to Mt. Calvary Lutheran Church or the Greenville Area Ecumenical Food Mission. To send flowers or a remembrance gift to the family of Sylvia Waters Emmons, please visit our Tribute Store. "Email Address" would like to share the life celebration of Sylvia Waters Emmons. Click on the "link" to go to share a favorite memory or leave a condolence message for the family.